Behavioral Finance-Loss Aversion-Is Your Mind Hurting Your Wallet? May Webinar: Behavioral Finance: Is Your Mind Hurting Your Wallet? Do you consider a tax refund free money? 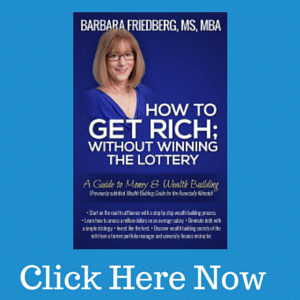 When you receive a money gift, do you spend with abandon? Has your retirement account been allocated the same way since its inception? 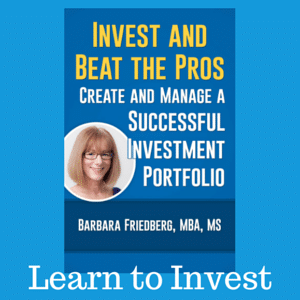 Do you refuse to sell a losing investment until you get back to “even”? Most of us consider ourselves to be rational decision makers. Yet there is an abundance of research which indicates that humans regularly make irrational money decisions. Some of these decisions are insignificant, others may mean the difference between a comfortable retirement or reliance on Social Security. Behavioral Finance is a relatively new field that explains financial decisions with psychology-based theories. This webinar will uncover common behaviors which appear quite rational on the surface and yet lead to less than optimal financial outcomes. The webinar is based upon the work of Kahneman, Tversky, Richard Thaler, author of “Nudge”, and other noted scholars. Click here to register for free webinar, “Is Your Mind Hurting Your Wallet”. Behavioral finance research proves there is a grand disconnect between how rational we think we are and reality. Investors frequently overestimate their investing ability. We regularly hang on to a losing investment, waiting to sell before we get back to even. Let’s take a look at how loss aversion, a behavioral finance concept, hurts your wallet. We are loss averse by nature. We feel worse after a loss than we feel good after a win. Because of this loss aversion, we try to avoid losing. Most investor’s have bought a stock or a fund, only to watch the price decline after our purchase. When that unfortunate price drop occurs, many investors go through this same litany of questions. Nokia was the premier cellular phone company for years with a market share greater than all its competitors combined. But, Nokia slipped and missed the market transition to smart phones. As Nokia continued to lead the low cost market in international cell phones, competitors began to steal market share from the company with newer more expensive smart phones, and greater profit margins. Kim, watched Nokia for years, but failed to purchase the Wall Street darling as it’s valuation was high due to the company’s popularity. Finally, in late 2008, Kim got his chance to buy. Nokia had at $40 per share at the beginning of 2008 and then the price began to drop. When Nokia hit $25 per share in mid-2008, Kim loaded up, certain that this was his opportunity to get in on a good company at a reasonable valuation. Kim thought that since the stock was recently selling for $40 per share, $25 was a great price and the company would likely rebound. Kim’s assessment and understanding of the company was faulty. The company was losing market share, and Nokia stumbled to get into the smart phone market. Apple, Samsung, and other players had a lead, and Nokia continued to lose market share. As Nokia hit the $18 per share mark, Kim deliberated whether to sell his shares and take a loss, or wait for the stock to rebound. Kim, like most of us, was loss averse and decided to wait for the company to rebound. 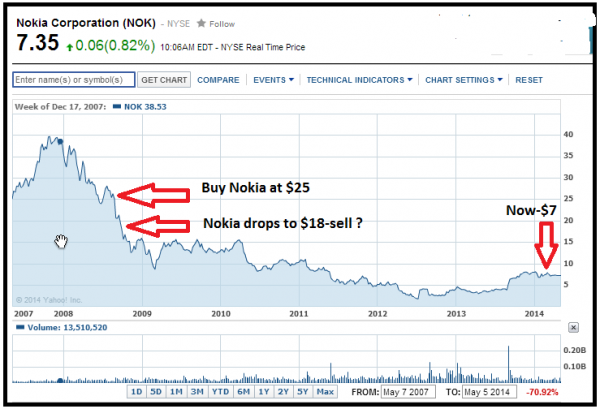 During the next few years, Nokia had some ups and downs in price yet never returned to the $25 purchase price. In 2011, after several years and greater losses, Kim finally decided to bite the bullet and sell his shares at $5. As history will illustrate, during the next six years, Nokia failed to regain it’s former glory. Kim’s irrational loss aversion cost him $20 per share and a missed opportunity to potentially sell earlier and reinvest his proceeds into a better prospect. Dismiss sunk costs or money already spent. Sunk costs are irrelevant. You’re not getting the money back. Forget about the mistake and move on. The stock or investment doesn’t care the price you paid and doesn’t promise to get back to even. For example, in 1982, Johnson and Johnson (J & J), the makers of Tylenol, took a hit after a malicious consumer injected random Tylenol bottles with poison. J & J took the Tylenol off the shelves in an expensive recall. That event caused J & J stock to temporarily decline in price, only to rebound at a later date. The Tylenol example was a discrete event in Johnson and Johnson’s history. After the company handled that problem, the company’s stock price continued to rise. The outlook for Nokia was gloomy, and hindsight proved that Nokia has yet to regain its former market share and profitability. Ask yourself after a price decline, “Would you buy this stock today if you didn’t already own it?” If the answer is “No”, then sell and move on to a better opportunity. Sign up for the free webinar and learn how correcting faulty behavioral finance errors might make you $60,000 richer over the long term. 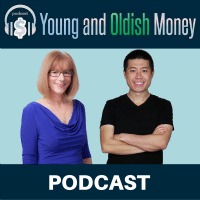 You’ll learn how mental accounting, the endowment effect, framing, anchoring, and herding behavioral finance errors are stealing your money.